Sleeping 6, our large private garden cottage is located just 50 steps away from Kailua Beach. The lush garden setting offers a large air conditioned bedroom that sleeps 4 (queen size bed and 2 twin beds), with a screened in lanai (sunroom) that sleeps two more on the queen sized day bed (punei). Exquisitely furnished with antiques and aloha, our cottage offers you the Hawaii that few will see. This 1200 sq.foot cottage embodies the type of living that Hawai'i is known for: From the screened in lanai (patio), to the fully upgraded kitchen, to an open garden area, our cottage offers island living at it's best. Famlies with children enjoy a large yard and the closeness of the beach. Beach amenities available at no extra charge: Boogie boards, sand toys, beach towels, and sand chairs. Kailua Beach Vacation Cottage provides a little bit more so you can bring less! Aloha! My name is Kelly La'a and I, along with my husband, Patrick would like to welcome you to Kailua Beach Vacation Cottage. We've welcomed visitors and returning Kailua residents to our cottage since 2003. We have grown up in Kailua and know how to help you find the best in what Kailua has to offer. - Located on a private road, you have a private access to Kailua Beach... - Only three homes from the beach - Only three homes from Kalapawai Market and the entrance to Kailua Beach State Park - Close to Segway of Hawaii, Bob's Pizza, K&K Bar-B-Que, Lanikai General Store, Island Snow & Kailua Sailboards and Kayaks! Landline always available for local calls in cottage. Main bedroom has air conditioning! As well as beach towels, boogie boards, coolers and beach chairs! Newly installed (2017) full size washing machine, solely for cottage's use. Newly installed (2017) full size dryer, solely for cottage's use. Bath and Beach towels provided in abundance. Newly installed (2017) full size fridge with ice maker! Fully stocked kitchen with dishes, cook ware and utensils. Just buy your food! Full Kitchen. All items in cottage are for the cottage use only and never shared. Full sized dining table with seating for 6. 2 flat screen tv's with full internet. Full library, donate or take....on site. Beach toys provided, coupled with lots of games, Lego's and blocks. Various snorkels and masks are available to use. 5 Golf courses are within 5 miles of property. Golfers should inquire directly with local courses for rates/charges. Wireless Internet, VCR/DVD/CD Player, Cooking utensils, pots/pans/china provided! Absolutely everything you need in the house! Kelly and Pat have thought of it all. 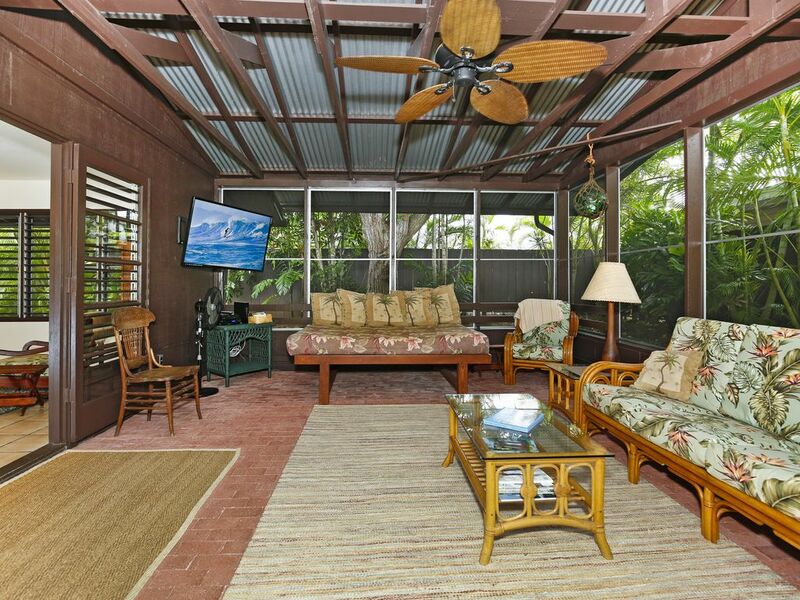 The lanai was a special spot, the kitchen well stocked, and bathrooms immaculate. Four stars only because the main road was busy and noisy. Not a thing to do with the cottage! Mahalo! The La'a cottage was just perfect for our family's trip to Kailua! It was immaculatey clean and very spacious. The kitchen was beautiful and well stocked with everything we needed for cooking and cleaning up. We enjoyed the tropical, well maintained yard and quick, peaceful walk to the beach. There were a ton of beach toys, chairs, towels and even a wagon which we really appreciated. There is a tall locking fence around the property which made us feel very safe and secure. Patrick and Kelly were very easy going, welcomong, helpful and kind. The location was so convenient being a short walk to the beach and also the town. I was a little worried about the road noise since it's right on Kaleheo but with the AC running at night we never noticed it. Hope to be back soon! We loved hosting your ohana! Looking forward to your future visits and watching your keiki grow... a hui hou! This was our fourth visit to Kailua and the first staying in this wonderful cottage - and we don’t want to stay anywhere else when we come back! It felt even more spacious and relaxing than advertised and Pat and Kelly are warm and gracious hosts. Our little one loved it, too - especially the proximity to the beach and her favorite Island Snow shave ice. Mahalo and we so enjoyed meeting your family...we look forward to having you folks back! A hui hou! A very functional space with the screened-in porch in the front and a mud room/laundry/bathroom at the back door. Very close to beach. The owners are very relaxed and generous. Kelly and Pat were gracious, friendly and solicitous hosts. We enjoyed every moment while there. It is a wonderful place to entertain friends and family. Thank you, Gerard & Betty! Loved having your ohana. Until your next visit, a hui hou! We absolutely loved this place! The home is larger than we expected. I don't think the owners accounted for the approximately 700 extra square foot lanai when calculating the home to be 1200 sqft. In our estimation it was probably more like a total of 1900 sqft of very comfortable living space. We wanted for nothing, except maybe a wall in the master bedroom dividing the room with three beds. It might work for some combinations of people. The bed/sofa on the lanai is very comfortable and I had some of my best nights sleep out there. My husband and mother-in-law said the beds in the bedroom were also very comfortable. The home is so open and breezy with new kitchen and bathroom remodels. It was such a nice place to spend a week and a half and when I couldn't be in the sun all day, I loved hanging out at the house. especially the lanai! The home had everything we needed and then some! We loved the neighborhood and area it is located in. It was an easy walk to the beach down a quiet street and a sandy beach path, Not 50 steps, but more like 240 steps. Not a big deal for us, just letting you know. The beach was beautiful. The couple who own the house wonderful! They gave us our privacy but were there if we needed them. When we first arrived, we were greeted with flowers, chocolates and beautiful Hawaiian music playing. Kelly, the owner came over to meet us What a nice person she is! This is a home we will definitely come back to year after year. It felt so much like home! Waking up to the sounds of tropical birds in the morning was nice. Some traffic sounds, but not bad. I would highly recommend staying here to anyone! We can't wait to go back to our little piece of paradise! Much for your kind review! A hui hou, or until we meet again! Mahalo!